We are thrilled to announce that we are expecting a little nugget of joy this August of 2017! 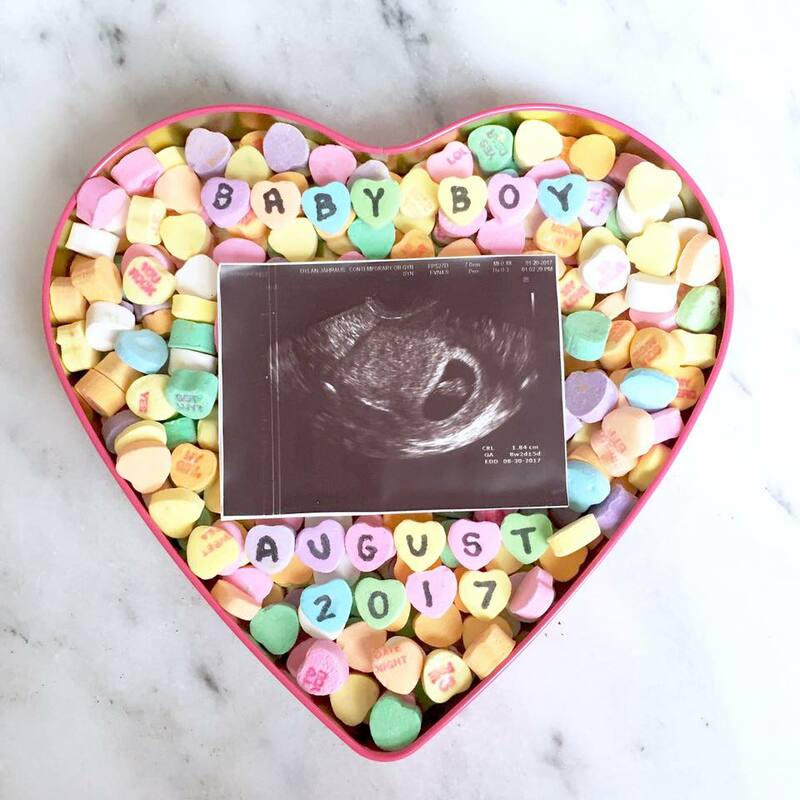 I am so happy to finally be able to share the news with everyone. My husband and I had been planning to have our first child while we are here in San Diego with him on Shore Duty. During this two year window he actually has a "normal" Monday-Friday job, he has weekends off, and he doesn't have to go underway on a submarine. Hallelujah! After a heartbreaking miscarriage in November, we were blessed with another pregnancy in December. It was God's little Christmas present to us and our families. 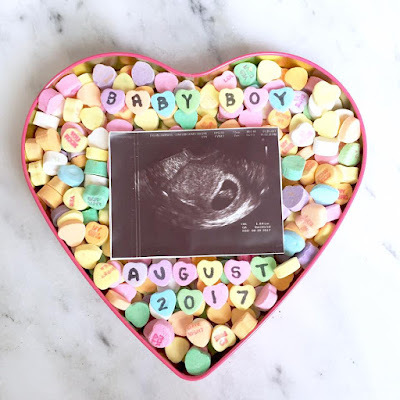 We were cautiously optimistic until finally we had our first appointment at 8 weeks and saw what we were hoping for... a strong, healthy heartbeat! It was the most beautiful sound. I feel like pregnancy is a time where God is visibly working in your life... testing your faith and giving you strength, all while designing the most intricate, one of a kind, perfect Child. I feel lucky to have the opportunity to bring this little one into the world. And I feel even more lucky to have the best husband and partner to share this with. I've decided to do a pregnancy blog to create a lasting memory of this experience. It will be so fun to look back on in the future to if/when we have baby #2. Not to mention, I have been that lady googling "9 week pregnancy update," "10 week pregnancy update," etc. 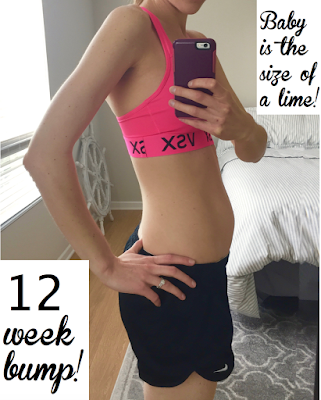 each week to see what others have experienced, so hopefully this will be interesting to other moms-to-be. Here we go! 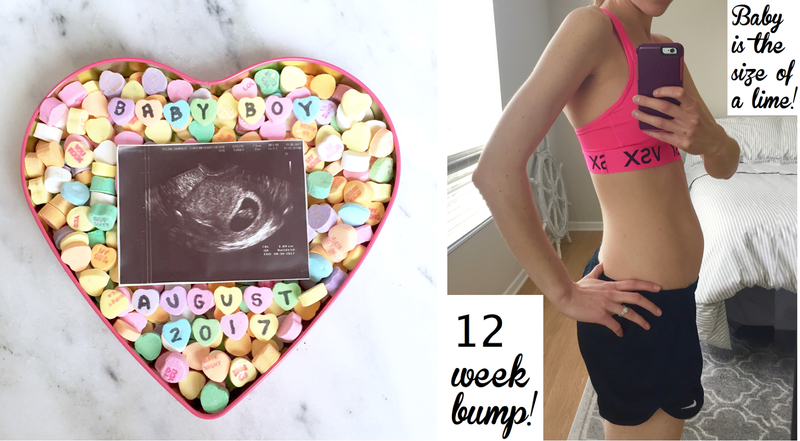 The first trimester has been a huge blur of nausea and exhaustion, but I'll give highlights of each week to cover the first 12 weeks, and then I'll do more regular updates from here on. Week 4: My husband and I were in Minnesota for Christmas and I had been super tired, hardly able to keep my eyes open. Sure enough, on December 20th we found out why-- we were expecting! Week 5: We were back in San Diego and had the pregnancy confirmed at the Naval Medical Center. I was hoping for blood tests to monitor my HCG levels like they did during the miscarriage, but they said they didn't need to see me until the 8 week appointment. Symptoms: Exhausted, dizzy, craving chocolate chips. Great combo. Week 6: This week we told my husband's family! This will be the first grandchild in both of our families. Biggest symptom this week: NAUSEA. It hit me like a wall. Part of me was so happy about it, because it reassured me that the baby was developing normally. I only got sick 3 times, but it was a daily struggle. We tried all the tricks in the book-- Preggy Pops, Seabands, Ginger tea, Pink Stork tea, sour candy, ginger chews (yuck), lemonade Vitamin water.... All I could eat were saltine crackers and chicken noodle soup. Week 7: We went on a hospital tour for expecting parents this week. I felt slightly out of place since the other moms looked to be about 7+ months pregnant, but I like to be prepared. Symptoms: Nausea, exhaustion and food aversions. I couldn't stand chicken, beef, breakfast foods, salad, vegetables, Mexican food, Chinese food, or sweets. Nothing sounded good. Week 8: Nausea continued this week, and at this point I felt so guilty for being no fun. My husband was incredible as usual, picking up my slack and helping with Etsy orders, doing the dishes, vacuuming, cleaning, etc. I felt like I was functioning at 10%. Week 9: The nausea was more manageable this week, and I had moved on to apples, cheerios, graham crackers, pb&j sandwiches, and macaroni and cheese. I ate like a 5 year old. We had our first ultrasound and got to see the baby and hear the heartbeat. We met our Dr. for the first time and she was super nice. Every other word was "sweetie" and "honey." Due to my sister's congenital heart defect our doctor ordered an extra blood test for us for 12 weeks to look at the baby's chromosomes as well as gender! Our due date was August 30th. Week 10: I was officially wearing my "fat pants" with the button undone.... yikes. My stomach was starting to protrude a bit and it was rock hard. The nausea was still in spurts and I seemed to alternate between good and bad days all week. Week 11: We took a trip to visit some of our extended family and the travel definitely put my nausea back at full force. I was eating nonstop every 2 hours on this trip to try to keep the nausea at bay... literally 2500+ calories a day. Despite all those calories I actually lost weight. Week 12: This was the big week! I had a special blood test that would look at the baby's DNA to determine the gender and look into specific chromosomes for potential issues. We found out that all of the chromosome testing came back negative! And we found out the Baby Jahraus was a BOY!!! My mom also came to visit this week so we got to take her to the 12 week appointment and the doctor did an extra ultrasound for us so grandma could meet her little grandson. Baby boy was jumping around a lot and it was amazing to see how much he has grown! His heartbeat was 166 bpm. This week we also announced it to my sister via FaceTime and she was SO excited! She will be the best auntie. Now it's time to start thinking of names for our little boy...!